Poncho - is hand crocheted in varied shades of blue, from pale blue to a striking turquoise. Pair this feather light poncho with a tank top or dress or just wear it with you favorite jeans and a tee shirt for a stylish summer look. The shawl has an asymmertrical design with one point (measuring 40" long) and also has a drawstring at the neckline. The drawstring features two charms, a seahorse and a starfish. 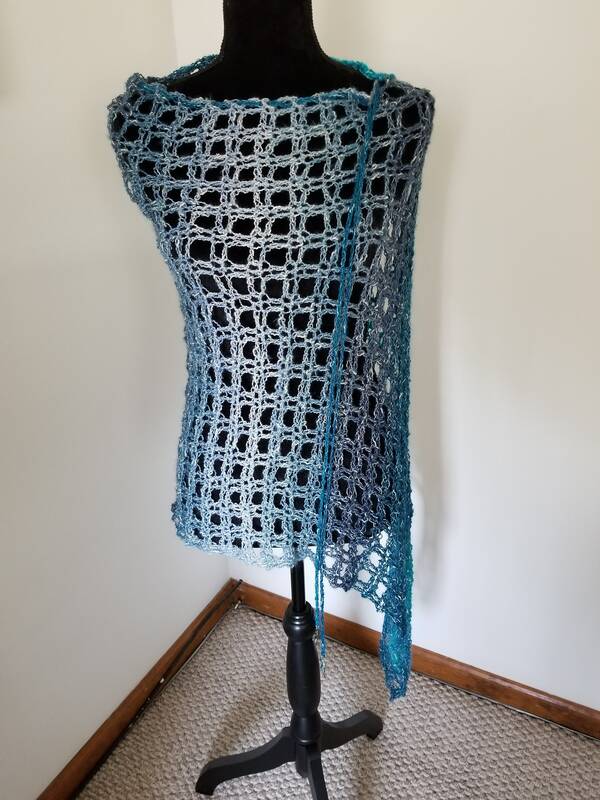 As mentioned the poncho is very lightweight and is crocheted using a cotton and acrylic yarn. It can be machine washed on gentle cycle and lay flat to dry. Measurement: One size fits all from Small to Large. The body measures 20 inches from neckline to hem, with the asymmetrical point reaching about 40 inches.